The comeback triumph opened up a nine-point gap on their opponents and all but ensured they will finish second in the Championship and avoid an extra round of play-off fixtures. 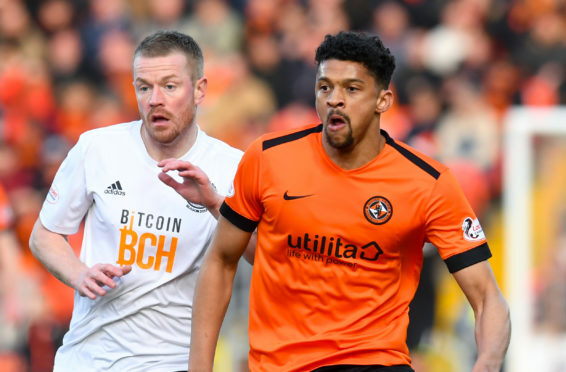 Steven Bell’s first half goal had United staring at a much less attractive proposition of a three-point difference between the sides and a clean sweep of defeats to Ian McCall’s men. This win, thanks to a stunning Pavol Safranko equaliser and a deserved strike for man of the match Paul McMullan, proved they can beat (and outplay) a team they may be facing again in a few weeks with the stakes even higher. And it also proved that they can win a live TV game after failing to do so on 13 previous occasions over the best part of two years. All in all, a good night’s work. Robbie Neilson set United up in a 4-4-2 formation, with Osman Sow partnering McMullan up front. The early signs for the newly-formed combination were positive. On four minutes McMullan took up a good position on the shoulder of his marker and when he was picked out by Ian Harkes with a pinpoint pass through the middle, he would have been in on goal had it not been for a poor first touch. McMullan’s pace has been one of United’s biggest assets in recent weeks and a ball over the top for him to chase two minutes later caused panic in the Ayr defence. Sow was the man to benefit when it broke back to him and a low 25-yard shot just went past Ross Doohan’s left hand post. Sow actually had the ball in the net on 18 minutes but it was chalked off for offside. He prodded home a Callum Booth shot that turned into a cross but it was an easy decision for the assistant referee to raise his flag. McMullan’s acceleration again caused problems for Ayr midway through the first half when he was tripped by Rab Crawford. Peter Pawlett got his free-kick over the wall but it went straight at Doohan. From being in control, United were a goal down on 24 minutes. Andy Geggan had a shot charged down just outside the box but the ball broke kindly for Andrew Murdoch, whose cross to the back post was met by Bell. Whether he meant to head the ball towards the other post for a team-mate to attack or go for goal himself, only he will know, but it looped over Benjamin Siegrist and into the net. It took the Tangerines a while to get any sort of attacking rhythm back after conceding but they finished the half on the front foot. On 37 minutes a Pawlett cross from the right picked out Sow but his glancing header didn’t have the power or the accuracy to find the bottom corner. Then in stoppage time McMullan dropped deep, beat his man and shot just past the post. There was a half-time substitution for Ayr – Mark Kerr in place of Geggan. It was an unconvincing start to the second 45 from United when Siegrist and Mark Connolly both went for a Declan McDaid cross and their combined clearance only evaded the Ayr attackers by good fortune rather than good judgment. On 54 minutes Daniel Harvie brought McMullan down just before he got into the box (and was booked for the challenge). Sow took the free-kick and lashed it into the stand. Things could have got worse for United shortly before the hour mark when a punt up the pitch was enough to release Lawrence Shankland beyond the centre-backs. The man who was so deadly last time he played here made a mess of his opportunity with a terrible touch that took the ball straight off his shin to Siegrist. Neilson made a double substitution seconds later. Sow, who had been starting to show signs of fatigue, and Callum Booth were replaced by Safranko and Nicky Clark. The latter had an immediate chance, stabbing an instinctive shot narrowly past the post. His fellow sub went one better, though, when he grabbed United a spectacular equaliser. A Harkes cross was helped on by Paul Watson. Safranko chested the ball down and struck as sweet a volley as you could wish to see past Doohan. The changes from Neilson had involved McMullan being switched to the right wing and it was from there that he scored the goal to put United in front. On 74 minutes Doohan was pressurised by Safranko and he coughed up possession with a slack pass. McMullan was in the box in no time and his shot, low and hard, went under the keeper’s body. United were hunting a third and Safranko cut inside on to his right foot but couldn’t produce the power of his earlier goal, and his shot was comfortably gathered by Doohan this time. In the dying moments Ayr tested Siegrist with a few crosses but United saw the game out pretty comfortably.